Sixteen92 is a company I have perused a few times, meandering the virtual aisles of their store. All the offerings looked amazing but I really didn't know where to start, until recently. Sixteen92 has the honor of winning an Art and Olfaction award this year for their scent Bruise Violet in the Artisan Category. Well heck, what better place to start sniffing than an award winning scent? 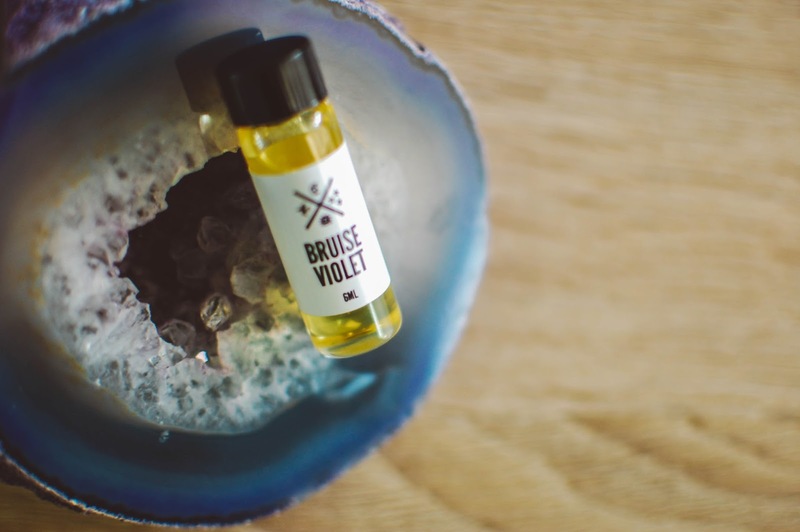 Bruise Violet- Notes: Red lipstick accord, dusting powder, white iris, violet leaf, Damascus and Bulgarian roses and red grapefruit zest. In the vial, nostalgic threads of memory stitch the feminine ghosts sitting at gilded vanities to this moment's feline grace perched tip toe up to the bathroom mirror sweeping violet scented mascara onto her lashes. Guerlain lipsticks, vintage face powders and a single dried rose in a tarnished silver vase rest in the glass tube. Dabbed onto my skin, the fragrance holds to same promise as the vial but then the violets conjure green tender leaves and amaranthine iris blooms awaken. The drydown melts into a demure rose and violet bouquet, velvety and plush. Timeless and resplendent on the skin, a marriage of bygone and modern. This fragrance can be purchased in a few sizes and in different formats. 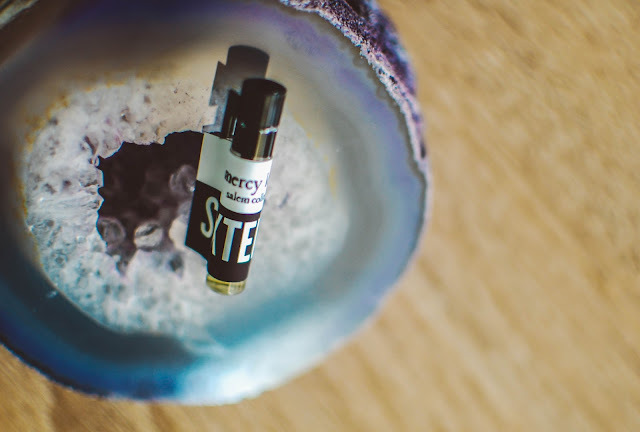 The premium fragrance oil comes in a 2ml sample for $4.65, a 6ml bottle (which is what I purchased here) for $15 (though it was $14 at time of purchase in May), and 10ml roll-on for $22. It also comes in a parfum concentration where 7.5ml is $20 and a 30ml bottle is $60. Shipping for the 6ml was $3.00 and came with a free sample. Mercy Lewis "The Salem Collection"- Notes: Heliotrope, honeyed tea, rosehips, sugared almond, creamy sandalwood and milky vanilla. In the vial it is a honeyed almond dream that is limpid. On the skin, the honey and almond crystallize into sugar cubes on a bone china saucer accompanied with a Cornish cream tea. 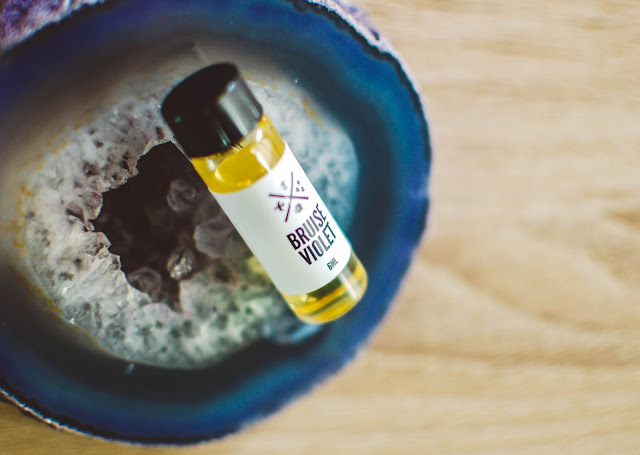 As it dries, milky sweet sandalwood highlights the honeyed almonds and cream that never quite fade from the senses. A truly delicious delight that makes an almond shy gal like me fall in love. I am very pleased with these two scents from Sixteen92 and I look forward to getting a sampler to test drive some more of these amazing sounding scents in the future. Do you have any Sixteen92 favorites? I know they used to sell wax too, have you tried it?